Corned Beef and Curry is a highly interactive band from Pittsburgh combining Celtic music with American Classic Rock in foot stomping, hand clapping, beer-drinking fun. 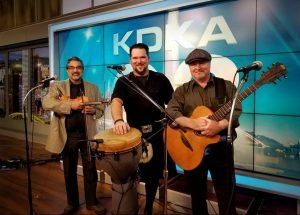 The band includes Bob Banerjee on fiddle/mandolin/guitar and vocals (Bob previously toured with the super group “Gaelic Storm” best known from being the party band from the movie “Titanic”), John McCann on vocals and guitar, and Brad “Hamish” Dindak on drums and percussion. Audiences across the USA rave about the fun and excitement this band brings to their venues. Tickets are $15 per person and include draft beer and wine. Chicken wings and burgers available for purchase from our kitchen. We are selling a limiting number of tickets and when they are gone, they’re gone. Get your tickets at the Bar or from the Entertainment Committee.